Take-off from the hilltop village of Sarangkot for a 20-30 minute tandem paragliding trip in Pokhara. An experienced pilot will accompany you to navigate the winds and ensure a safe paragliding experience. All you need to do is sit back in the glider as ascends 3,000 feet above the ground. From here, you'll get some of the most spectacular views of the Phewa Lake below you and mountains of the Annapurna Conservation Area on the horizon. Gliding over the terraced farms, villages and grasslands of Pokhara, you'll land in Pame after a thrilling session of paragliding. Sarangkot is a small village located at an altitude of over 5,200 ft atop the namesake Sarangkot mountain. The area is known for some of the most amazing views of snow-capped Himalayan mountains like Dhaulagiri, Manaslu and Annapurna. These views, coupled with perfect wind activity for flying, make the village a hotspot for paragliding trips. On this tandem paragliding trip in Pokhara, you can avail a pick-up service from most hotels in Lake Side, Pokhara. After ending the flight at Pame, you can also avail a drop-off service back to most hotels in Lake Side. • Get a bird's eye view of gorgeous landscapes while paragliding in Pokhara. • Catch views of snow-capped mountains on the horizon. • Enjoy the thrill of flying over 3,000 ft above ground. • Glide over the mountain slopes of Pokhara for 20-30 minutes. 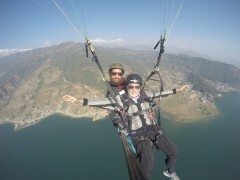 Travellers are required to follow instructions of the tandem pilot while paragliding at Pokhara. For cancellations made more than 3 days before departure of the Pokhara paragliding trip: 50% refund. For cancellations made more than 3 days or less before departure of the Pokhara paragliding trip: no refund. All cancellations will be charged a flat fee of INR 200 per person, by The Great Next. All refunds will be subject to a foreign currency premium/discount. Flights are scheduled to take-off in three time slots: 09:30 hrs and 11:30 hrs. However, wind and weather conditions may cause delays. Travellers are required to be older than 8 years to participate. However, this will depend on the height and weight of the child, and will be up to the operator. The operator's word is final. | Travellers younger than 18 years will need parental approval/signatures and will be allowed at the discretion of the tour operator. Paragliding is a wind-dependent adventure sport. Accordingly, the tour operator reserves the right to alter or cancel the itinerary of paragliding in Pokhara to ensure maximum safety for travellers as well as staff. The tour operator takes utmost care to ensure safety of the travellers and shall not be held responsible for any mishap or accident while paragliding in Pokhara. The prices for this operator will change depending on the dollar exchange rate, and may be subject to a foreign currency premium/discount. If you're staying at a hotel in the Lake Side area of Pokhara, you'll be picked-up and driven to the take-off point, approximately 45 minutes before your flight timing. Once you arrive at the take-off point, you'll have a quick briefing session to understand the protocols and rules to be followed during the flight. Suit up in the harness and take-off to enjoy an exhilarating 20-30 minutes of tandem paragliding across the mountain slopes of Pokhara. You'll land in the grasslands of Pame. Take the transfer back to your hotel in the Lake Side area. Your trip ends here. Buckle down for a 20-30 min tandem paragliding flight in Pokhara. All equipment required for paragliding: helmet, harness etc. If you're staying at a hotel in the Lake Side area of Pokhara, you'll be picked-up and dropped-off from your hotel, approximately 45 minutes before your flight time. Accordingly, you're requested to communicate the location of your hotel to the tour operator after receiving confirmation of the booking. If you're staying at a hotel outside the Lake Side area of Pokhara, you can travel to the take-off point, located in Sarangkot via private cabs/taxi.